wiley influenced sound palette painted in abstract expression. hear guns being loaded and cameras popping off. new from logos. 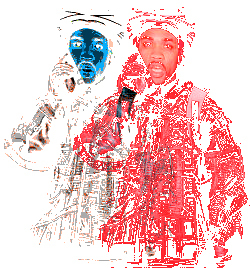 meanwhile, the elusive one himself has been organising grime raves in dubai and prepping a new pop single for the summer. heatwave drops at the end of july and is actually not bad. meanwhile he’s just dropped a mixtape of 10 grime freestyles (get that here). and is already working on the next steppps. forthcoming on ResonanceFM GRIME NUMBERS edited by autodespair. it’s a great, dense edit of numbers being announced on pirate radio. most of the stations are playing grime. in case you don’t know, when a listener wants to give appreciation to a tune or a vocal they’ll send a missed call to the studio phone, the host then reads out the last three digits of their number. grime numbers has these, the various studio numbers, the station’s frequency and even lyrics which use numbers (wiley on the 38 bus). a few years ago, Kode9 did a similar piece which just concentrated on those last three digits of callers’ numbers. it came on a cd published with a great experimental radio book called ‘radio territories’. there’s a review of the book here. here in full. less numbers, more MCing. a set for deja vu fm from 2003 with just about everyone in the scene (wiley, d double, a young dizzee, crazy titch, lady fury etc. etc… ). there’s an explication of the video by dan hancox here. and up to the time…. 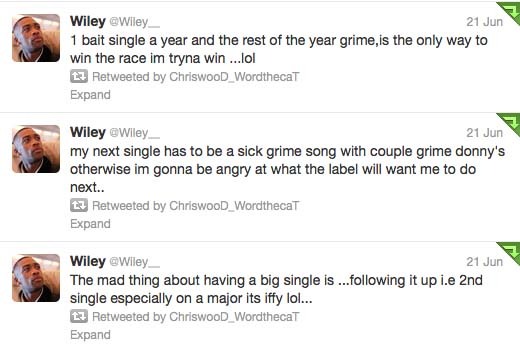 i’m sure you’ve heard that Wiley gave away 200 tracks last week. you can nab all 11 zip files here. this is like a ready-made post for blogs. time (to listen) becomes a bigger commodity than data. self-appointed aggregators stand up. BUT. 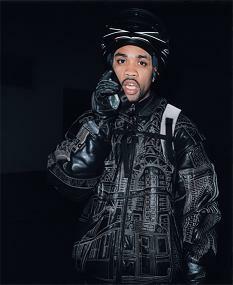 it’s also a nice side-step for someone who is working on material for a multi-album record deal, as well as being a tribute to Wiley’s insane level of creativity “there ain’t much rest involved”. a lot of the material is rough, unmastered but still strong. BUT. it’s also interesting for the idea of archive. i’m sure i’m not the only one who has had a hard drive die and felt a massive sense of relief that i lost a shit_ton of music. there’s a big anxiety when music is petrified into file trees, sub-directories and ultimately compressed into binary data. contingency and surprise are more fun. so, in no particular order, here are some new Wiley tunes. he’s got range. spending time in the north. spending time with autotune. beat like sugar bars hard like caramel. pop. wide. sample. your lose your love. tom lea brings a ruff sqwad primer. rapid’s production is ridiculous whether you used to like the smiths or not. (disclaimer: I can do ‘this charming man’ at karaoke). anyway – some ruff sqwad audio. huge. off guns n roses 2. huge. i’ve got a bit of a soft spot for the more recent air_grabbers too. here with canals under a busy high end.